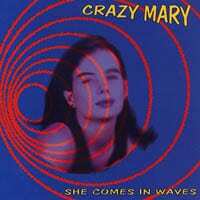 Crazy Mary is a NYC based quintet that’s grabbed considerable attention on the college radio front with a pair of indie releases. Last year’s She Comes In Waves is a fine representation of what they do. A wonderfully inventive and eclectic (you might think I’m using that word too much, but I’m not) band. Crazy Mary simply refuses to stick to any one particular style. Well, unless you want to say the band is reminiscent of the Mekons. That would be fair. And a high compliment, as regular readers will note. Crazy Mary expresses lots of strange ideas in even more unconventional fashion. And yet, it’s still rock and roll. From Venus perhaps, or Mars, but the roots can be spotted. With two principal songwriters, three singers (two male-the writers-and one female) the comparisons to the troupe-formerly-hailing-from-Leeds increase. The real trick to making this sort of music convincing is evoking a sence of vulnerability and fragility, as if we are seeing inside the collective heart of the band. Um. Uh okay. There are 12 songs on this 40-something minute cd. 5 people are entirely responsible for what you hear. That’s all I should say. But pressing on. I’m listening to Cancer on the Photograph. It’s weird like bongwater. It’s odd, within a rock and pop setting. That’s the whole CD, not just this song. I’ve never heard “we’re all gonna die” exclaimed with more happiness than in “Shot By Bullets” I don’t know if I should take them seriously or tear my hair out and run through the NYC streets naked, waving something rude. I do believe either action would be perfectly reasonable after a session with Crazy Mary. I say all of that in pseudo jest you know, because they are tearing up college charts all over the place, being played out of tons of speakers. Influencing our younger generation to thinking about things differently, to de-popping the mainstream radio dials, and getting a new genre heard and loved throughout New York state (at the very least).